I'm really starting to get in to proper American BBQ. Slow cooked, smokey, spicy and sweet with layers of flavour that blend and merge to become something greater than the sum of their parts. The problem is though, the majority of authentic barbecue recipes are ridiculously complicated, take days to do, and call for huge pieces of meat and machinery. But with a few hero ingredients, and a lot of time and patience, you can create some excellent deep south flavours at home. Brisket is a tough cut of meat but it has bags of beefy flavour, and an open, rough grained texture which lends itself to long, slow and low cooking. Because of that big flavour it also holds up really well to powerful spicing and smoking. This recipe takes a day or so including marinating time, but honestly couldn't be easier and requires very little active cooking - and once it's in the oven you can go to the pub for the afternoon and forget about it. Combine the dry rub ingredients in a large bowl, then place the brisket into the bowl and work the dry rub into the meat with your hands, ensuring all surfaces are well coated and rubbed in. Transfer to a zip seal freezer bag and place in the fridge to marinade over night (ideally between 24-36 hours). Take the meat out of the fridge to come up to room temp as you prepare the sauce. In a large oven proof casserole dish (I use a cast iron one) fry the onion on a low heat in a good glug of olive oil until just soft. Add the crushed garlic and fry for another minute. Finely slice the rehydrated chipotle peppers, reserving the water, and then add both to the pan along with all the other ingredients apart from the brisket. Bring the sauce to the boil and simmer for 5 minutes. 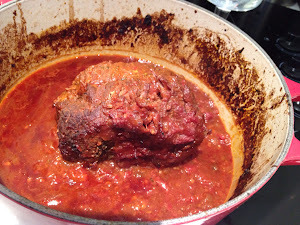 Place the brisket in the centre of the sauce, cover with a tight fitting lid and transfer to the centre of a pre-heated oven. Cook for 6 hours at 125*C. The meat is ready when you can push a fork through it. When the meat is ready, remove from the oven, wrap in tin foil and leave to rest. Reduce the BBQ sauce on the hob until thick and sticky. Adding a little honey if you want it sweeter, or seasoning if needed. If you have a hand blender then you can whizz the sauce at this point, but I quite like it a little bit rougher. You should be able to pull the meat apart with two forks. 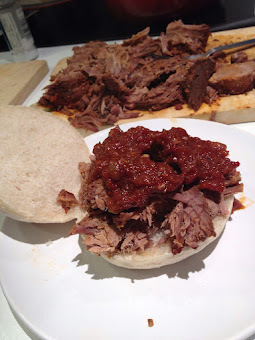 Serve big hunks of brisket on good quality soft rolls (I got mine from the bakery in Dock Street Market) along with a big spoonful of the sweet, spicy, smokey BBQ sauce. Top with thin slices of pickle if liked. The beer I had with this was a no holds barred, big, brash, belter of a beer match if I do say so myself, the wonderful Aecht Schlenkerla Eiche Rauchbier. It's a smoked Doppelbock from Germany that I absolutely love, and which works amazingly well with the smokey flavours of the chipotle, but has a bit of sweetness to match with the sweet and sticky sauce. 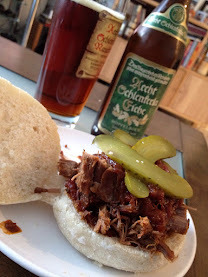 Oooh I've been looking for a bbq sauce recipe - where did you get your chipotle's from? I got them from Tesco's World foods section. Glad you like the recipe!